The scene at the Economic Club of New York meeting today had the feel of a rock concert, but instead of T-shirts and sneakers, it was blue pin-stripes and brown wing-tips. The mood in the lobby outside the room at the Marriott Marquis where Janet Yellen would speak seemed downright giddy. Blackstone Chairman & CEO Steve Schwarzman was smiling and shaking hands with old friends. The grin on Former SEC Chief William Donaldson's face looked like he had something funny he wanted to tell an old colleague as he made his way across the room. There was a genuine feeling of warmth as older Wall Street scions mixed with younger hedge fund hotshots. They were all there to cheer their diva of monetary policy, Janet Yellen. And the Federal Reserve Chairman didn't disappoint the crowd with talk of premature tightening or runaway inflation. Instead she kept to her new tune: Interest rates will likely stay at current levels "for a considerable time after asset purchase program ends," she said. And it was exactly what the room wanted to hear and the rest of Wall Street too. Going into Yellen's speech, the Dow was up over 100 points. While it dipped into 90-point gain territory during some parts of her comments, it was up almost 120 points by the time she stopped talking. The markets stayed up for the rest of the day, extending a three-day uptick. It was a far cry from her performance at her first press conference nearly a month ago when she rocked Wall Street by suggesting that the Fed might begin tightening rates six months after finishing its asset purchases. Yellen later spent a considerable amount of time trying to soothe the markets following what many have called her first big faux pas. But there was no hint of that in today's speech before the Economic Club of New York, an august group that was founded back in 1907 and has Wall Street's cream of the crop in its ranks. Yellen covered many of the things she has been saying even before she became Fed chair: the recovery in the labor force is exceptionally slow, and that the Fed isn't on some pre-set course to adjust the pace of purchases. She said the Fed will adjust policy when it feels it has to. She also added that she thought much of the recent weakness is related to the harsh winter weather and that she and her colleagues are working to develop a more nuanced judgment about "when the recovery of the labor market will be materially complete." Some StockTwits traders weren't impressed by the lack of concrete details. "$SPY never heard so much talking without saying anything," said OutTheBull. "$SPY Does anyone else find it fishy that Yellen makes these dovish statements every week or two as the market violently swings?," said ink. Some listeners were also disappointed that there were only four questions in the Q&A period. The two inflation curmudgeon questions came from Harvard Professor Martin Feldstein. He asked if Yellen would raise the federal funds rate above the inflation rate if she had to. Yellen sidestepped details and said, "If we get over 2% on the inflation rate as the recovery proceeds it's obvious we will have to change monetary policy so we don't overshoot our inflation goal." The other question from Feldstein: How will the Fed prevent itself from getting behind the curve on inflation? Yellen said that the Fed will look at a wide variety of indicators. "One measure of the labor market slack is wage pressures that can translate into price pressures." Then she added, "There might be surprises". 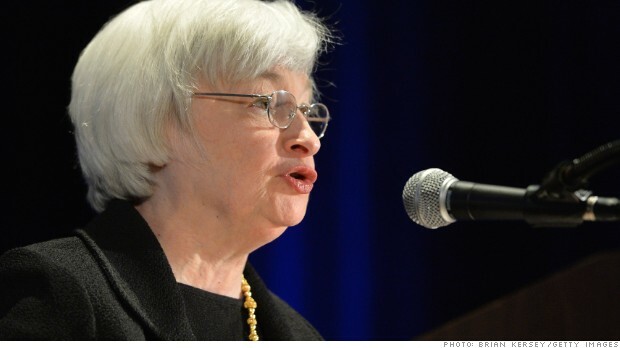 She would not rule out that inflation levels could rise to where the Fed would have to act on them. While she said she didn't anticipate that, "there could be a lot of twists and turns." CNNMoney's Patrick M. Sheridan contributed to this report.